Up until recently you’ve probably never heard of Grandin Village, Virginia. In the Roanoke Valley it’s known for its funky vibe and local shops, but after one barista put up a message on a sandwich board outside CUPS coffee & tea, people are coming to the small community from all over the country. The photo of a funny message was posted on Reddit recently and it quickly went viral. Its author Austin Simms says he never wanted to be famous; he just tried to be funny. I hope you get lots of customers, sir, and I hope they’re as well-mannered as you hoped they would be. 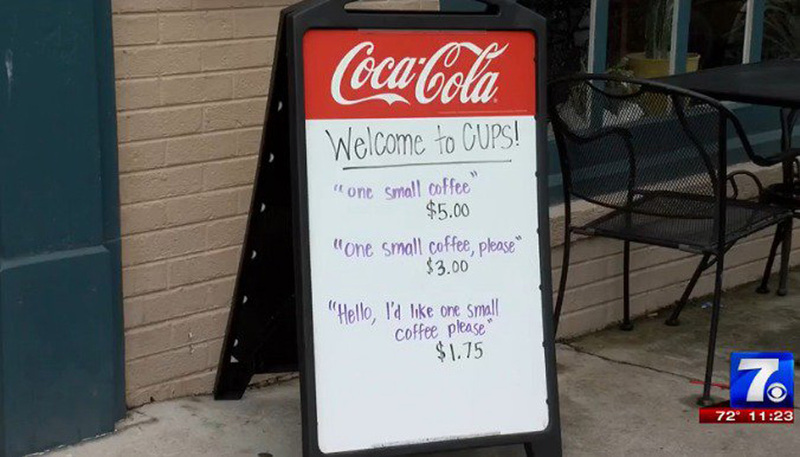 Coffee shops should do this more often. She Starts By Stacking Cinder Blocks In Her Backyard. The End Result? STUNNING! !